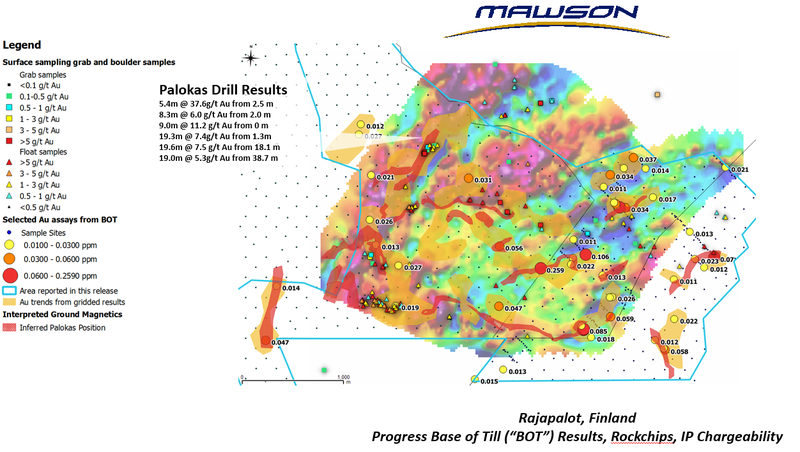 Vancouver, Canada – Mawson Resources Limited (“Mawson”) or (the “Company”) (TSX:MAW) (Frankfurt:MXR) (PINKSHEETS: MWSNF) announces results from infill drilling at the Raja permit and the first systematic base of till (“BOT”) drill program underway at the Kairamaat 2-3 permit area within the Rajapalot gold project in Finland. The BOT drill program consists of shallow grid-based drilling designed to test for gold mineralization beneath thin glacial soil cover. o206 infill BOT holes at 25 metre spacing drilled east of Kairamaat 2-3 at Raja (Figure 1), and outside Natura 2000 areas, have defined six diamond drill-ready targets. 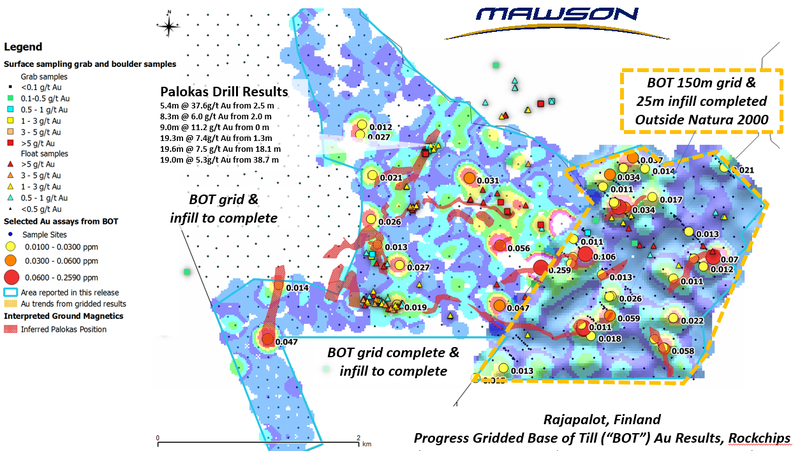 This is a follow up to grid drilling as reported on Mawson News Release October 25, 2016. 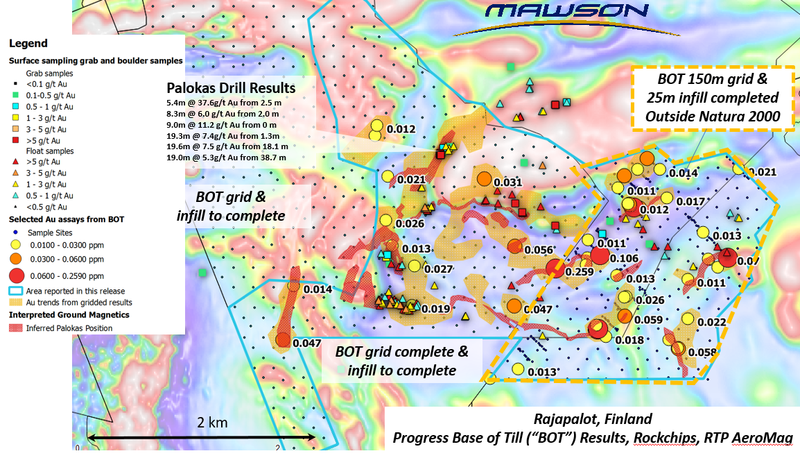 Encouragingly, gold mineralized BOT samples match and better define the surface trend of the Palokas prospect where previous diamond drill intersections include 5.4m @ 37.6 g/t gold from 2.5 m and 19.3m @ 7.4 g/t gold from 1.3m. True thickness of mineralized intervals is interpreted to be approximately 90% of the sampled thickness. Diamond drilling continues with two drill rigs operating 24/7 at Rajapalot. Results from this program will start to be reported shortly. 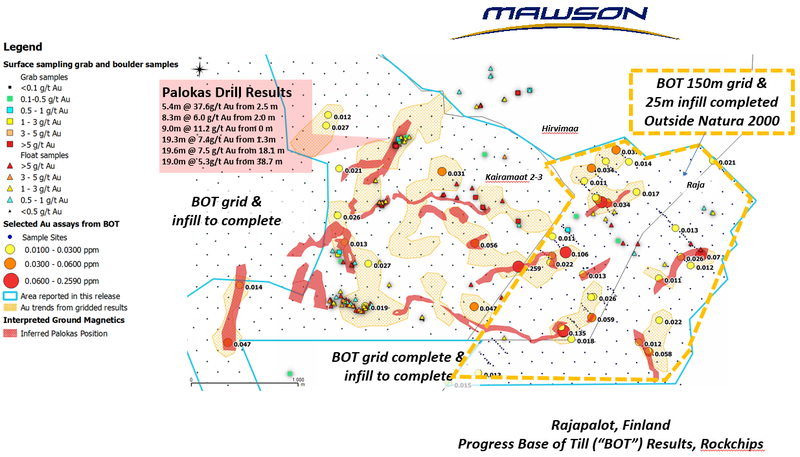 Drilling took place over an area of 3 km x 4 km on Mawson’s recently granted exploration permits at Kairamaat 2-3 and Hirvimaa and within an area covered by a landholder permit on the Raja exploration permit application area (Figure 1). 920 grid based BOT drill holes have now been completed inside exploration permit Kairamaat 2-3. Till depth varied between 0.3 and 11 metres and averaged 4.4 metres. Four different sample types were described from the drilling data: glacial till (7% of all total samples), weathered bedrock (59%), diamict or reworked till (31%) and reworked and transported sand (3%). Areas of geochemical anomalism for follow-up were based on multi-element Au, Te, Cu and Bi results, and normalized to sample type (weathered bedrock and till varieties) as well as geological observations, including the presence of hydrothermal alteration minerals. Most geochemical anomalies have been defined in weathered bedrock. The qualified person for Mawson's Finnish projects, Dr Nick Cook, President for Mawson and Fellow of the Australasian Institute of Mining Metallurgy has reviewed and verified the contents of this release. Samples were transported by Mawson personnel from site to Rovaniemi for logging and then submitted via commercial transport to ALS Global Ltd's laboratory in Sodankyla, Finland where the samples were prepared and sent to ALS Global Ltd's laboratory in Galway, Ireland to be analyzed by ICP-21 method (D.L 1ppb Au) and MS41 method (remaining elements). The QA/QC program of Mawson consists of field drill duplicates and the systematic insertion of certified standards of known gold content. In addition, ALS Global inserts a number of blanks and standards into the analytical process.